TOPEKA, KS—As the debate over the teaching of evolution in public schools continues, a new controversy over the science curriculum arose Monday in this embattled Midwestern state. Scientists from the Evangelical Center For Faith-Based Reasoning are now asserting that the long-held "theory of gravity" is flawed, and they have responded to it with a new theory of Intelligent Falling. Caption: Rev. 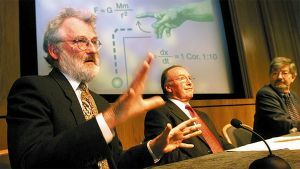 Gabriel Burdett (left) explains Intelligent Falling. Note: the above article is a joke, at least at present (but could you tell? does it sound familiar? ); the Onion publishes satire and the like.